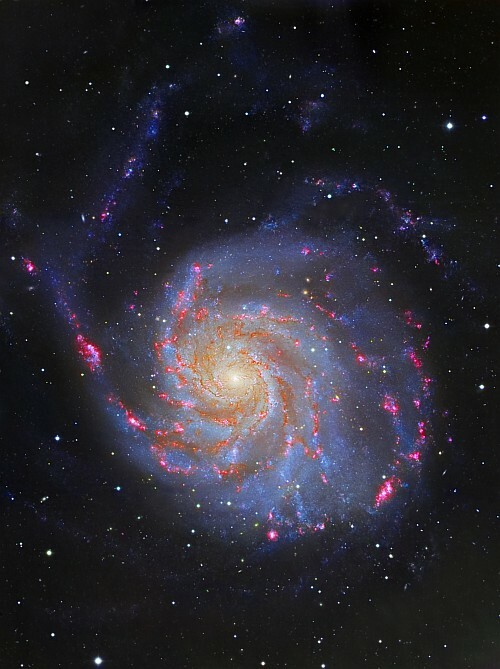 The Pinwheel Galaxy, also known as Messier 101 or NGC 5457, is a grand-design spiral galaxy located at a distance of about 27 million light-years from Earth. It is nearly twice the size of our Milky Way. M101 is usually referred as a classical example of an spiral galaxy. The observed deviation from symmetry is associated with a recent galaxy encounter, that triggered strong star formation visible now as bright HII regions, or the red spots in the image shown above.